A memorial was held at Kaneohe Marine Corps Base Hawaii yesterday for three island Marines killed recently in Iraq: Lt. Col. Max Galeai, Capt. Philip Dykeman and Cpl. Marcus Preudhomme. 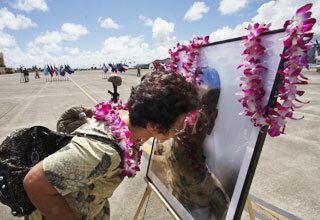 After the ceremony, a tearful Kalala Galeai kissed her son's picture and softly told him that he did good for himself, for his family and for his country. The IAU in Paris dubs the newly discovered dwarf planet "Haumea"